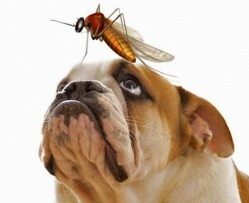 It only takes ONE bite ... an infected mosquito bites your dog or cat and deposits tiny microscopic larvae into the bloodstream. These larvae grow into mature worms that eventually settle into the heart and/or lungs. 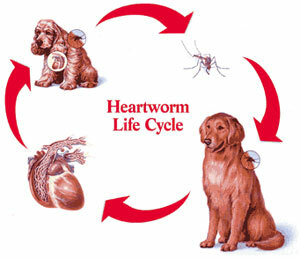 Symptoms of heartworm disease include coughing, weight loss, lack of energy and labored breathing. If left untreated, congestive heart failure and eventual death will occur. Remember, prevention is key. First, get your dog tested every year. Why, you ask? Because giving the medication to a dog already infected with heartworms can cause further complications. It's a simple and easy test ... a small sample of blood is drawn and checked to make sure it is negative. 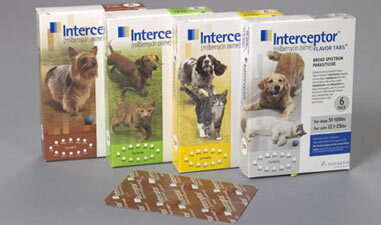 Here at Star Prairie Vet Clinic, we recommend Interceptor Flavor Tabs for your dog. They're tasty, convenient, and effective. ** It's important to know that heartworm pills should be given EVERY month, year round. Mosquitoes can live a long time indoors, even throughout the winter. In addition, Interceptor heartworm tablets contain a deworming ingredient that treats your dog for many intestinal parasites such as roundworms, hookworms and whipworms. Yes, cats can get heartworm disease, too! Even if you don't let your cat go outside, mosquitoes can get inside your house. While it's true that cats don't need to have a blood test every year (I know, I know, it's complicated ... ask Dr. Hanson, he'll answer your questions), they still should be given a monthly preventative, year-round. 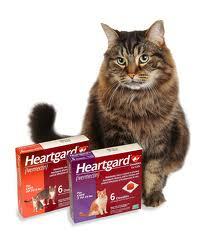 Either Heartgard Plus chewable tablets or Revolution topical products work well and are convenient and economical. Just ask one of our knowledgeable staff members, we can recommend the product that will work best for you AND your feline friend.